We have recently run several stories relating to US E2 visas, and Irish and UK visas . 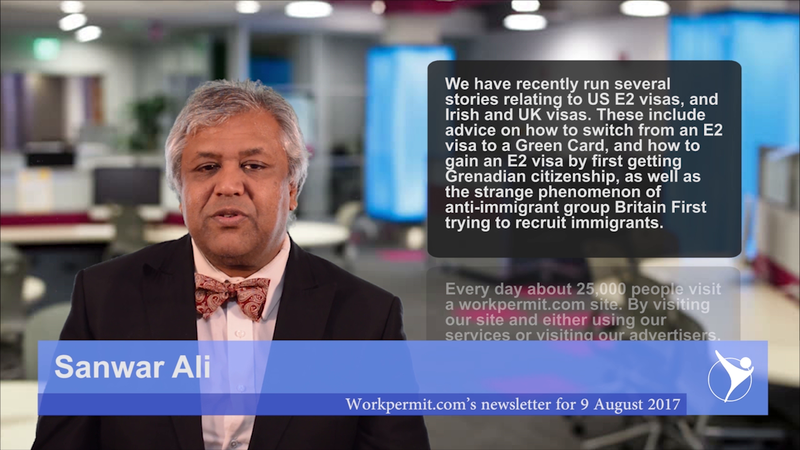 These include advice on how to switch from an E2 visa to a Green Card, and how to gain an E2 visa by first getting Grenadian citizenship, as well as the strange phenomenon of anti-immigrant group Britain First trying to recruit... immigrants. There are several routes a foreign investor can take to switch from a US E2 visa to a green card (permanent residence). Investors should be aware that becoming a permanent resident in the US means a taxation on worldwide income. However, provided that investors have a sound tax plan in place, problems can be avoided. For investors from those countries without an investment treaty agreement with the US, they can obtain an E2 visa indirectly via the Grenada Citizenship by Investment Program (GCIP). For citizens of countries including Brazil, China, Dubai, Lebanon, Russia and a number of Arab states, the GCIP is a good option. Citizenship applications for the Caribbean island of Grenada have boomed in the last three years. Reports have emerged that Grenada’s new citizenship by investment program, introduced in 2014, is being used for US E2 visa applications. Grenada is the only Caribbean country with a fast-track citizenship programme, which signed a Commerce and Navigation Treaty with the USA. As a result, Grenada’s citizens are eligible for the US E2 non-immigrant visa. Global jobs site, Indeed, claims that interest in the Irish work permit among UK-based workers is growing. Data collected by Indeed indicates that hundreds of thousands of Britain’s labour force are seeking employment opportunities abroad, including Ireland. The spike in international job searches has been attributed to concerns over Brexit. On the other hand, workers wanting to enter the UK can take advantage of the Tier 2 visa category, which allows skilled workers to take up employment with a Tier 2 Sponsorship License holder. Despite a manifesto that calls for an almost complete stop to immigration, Britain First – a far-right-political party in the UK – is actively looking to recruit Polish immigrants. Although the group has no elected officials at any level of government, they have amassed 1.9 million likes on Facebook – more than any other political party in the country.